« “Shaft,” as you’ve never quite heard it . . . Remember how “RIF” in my world really stands for “Random Illustrator Feature”? Well, I’m back with another RIF, this time with an illustrator who visited us once before. 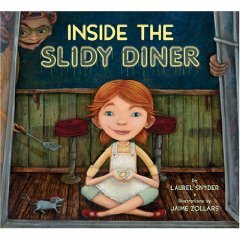 This week, I saw a copy of Laurel Snyder’s first picture book, Inside the Slidy Diner (Tricycle Press, October 2008), illustrated by Jaime Zollars. Jaime stopped by 7-Imp this past February to show us some of her beguiling art work but wasn’t able to share Slidy Diner art at that time, so she’s stopped by today to share some. How to describe this book? The Slidy Diner is no ordinary diner, that’s for sure. It’s creepy, slimy, icky, gooey, and…well, slidy as all get-out. There’s a mice-and-mumble man, pictured below (“a gray man at the counter who mumbles and smells like mice,” that is); there are some wigglepedes, slanting floors, moldy walls with black trim, and tilting tables; there are cookies you better watch out for, since what look like chocolate chips are really tiny bugs crawling off your plate; and there’s Ethelmae, who works at the diner, sees everything, and saw when our bold protagonist stole a lemon drop from behind the counter. This is why she spends her days at the Slidy Diner, “the greasy spoon of stuck,” where “the noise is always” but there’s never any music and where someone is usually running with scissors. Our protagonist is pictured above there at the top of this post, luring in a friend—perhaps trying to make one—to whom she gives a tour of the diner in this macabre adventure. So, is this lemon delicacy her entry into an imaginary world, one of eerie eating and disgusting diners? Or does she already spend her days in said diner and use the candy to lure friends into a make-believe world of silver whispers and blue secrets in order to feel less alone? I’m not sure, and maybe I’m missing something, but I don’t think so. I think Snyder’s created an alluring tale of fancy and wonder, which respects the child reader’s ability to decide the reality of the girl’s world for him- or herself. 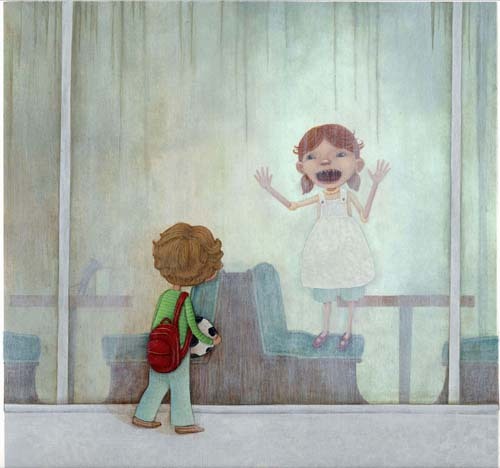 And Zollars’ art is evocative, concise, a perfect creepy match for little ones who will want to, as Kirkus put it in their review, visit this diner repeatedly, poring over all her details. Many thanks to Jaime for the art! Unlike the Slidy Diner, I can’t make any promises about banning my own goodbyes here today. The wider, non-cyber world calls. But you can meet me in the Slidy Diner. Illustrations copyright © 2008 Jaime Zollars. Reproduced by permission of the illustrator. INSIDE THE SLIDY DINER published by Tricycle Press, an imprint of Ten Speed Press, Berkeley, CA. I like so many of the things that Ten Speed Press puts out — they do the random well. And this is a …completely weird book. I’m still mildly traumatized by the flies on the back of that chick’s sweater. Euuugh. Madly, magically, detailed… this is definitely a book to ignite the imagination! It looks gross but in the coolest way. One thing I love about kids’ books, especially what are nominally “picture” book, is when the author uses words which are just right. Slidy Diner announces right up front that it’s going to be a book like that. “Slidy” is a true kid’s word — an adult would probably have used “slippery” or something, but when a kid is first picking up on the way words are made, simply tacking a -y ending on a verb is exactly the kind of choice s/he makes. And then combined with “diner” — like, huh? You mean not just little things like dishes and hands and books can be slidy, but whole BIG things like diners?!? Oh, and then I followed the link to Amazon where I read more of the Kirkus review: “Sometimes Ethelmae grins at you, and you can see her tooth.” Ha ha — that singular noun there says a LOT about Ethelmae! I do love macabre kids’ books. This probably warped the outlooks of every single niece and nephew in my life. TadMack, hee. Yes, those flies are traumatizing. Children will most certainly “ew!” a lot with this read. Shoot, I was, too, when I read it with my girls. Let’s just say you won’t want to eat that sticky bun that Ethelmae picks back up off the floor to serve to a customer. JES, I do really love Laurel’s writing in this book. I think I included my favorite part, in which she mentions the ladyfingers and then adds, “they really are.” (And Jaime’s illustrations for moments like that are satisfyingly EW! but not absolutely terrifying for the wee ones. That balance must be hard to pull off.) And the diner being a “greasy spoon of stuck”? I love it. Kinda cool and kinda creepy! Jules, Ooo, I want to get my hands on this book. TadMack, Seriously, I should maybe not have read this right before lunch. Liz, It seems to me that quite a bit of life is kinda cool and kinda creepy. I’m going to have to remember that one. That looks super cool. I love books that move away from the old formulas, with interesting human characters. I nominated Seven Impossible Things Before Breakfast for the I Love Your Blog Award. http://www.debrennersmith.com Very neat book. Thanks for sharing and writing up books. Holy moley, I LOVE that artwork. Fan-freakin-tastic! Jaime’s work is just insanely good. And this freaky thing happened as she worked on the art, where I felt like she had crawled inside my brain. The text is based on 4 years I spent in an Iowa diner, and there are all these details in the book, things she “imagined”, but that are right from the walls, staff/ tables of the Hamburg Inn #2. I’m honored to work with her!!! Thanks so much for the post! I loved illustrating such a great story and I’m so glad that people like it! Yay for Jaime and her book! Jaime, I’m so sad you moved off to Maryland, now our illustrator group RARELY gets together anymore.